The taxi ride from Varkala Beach northeast to the Kumarakom lakes area took about four hours. 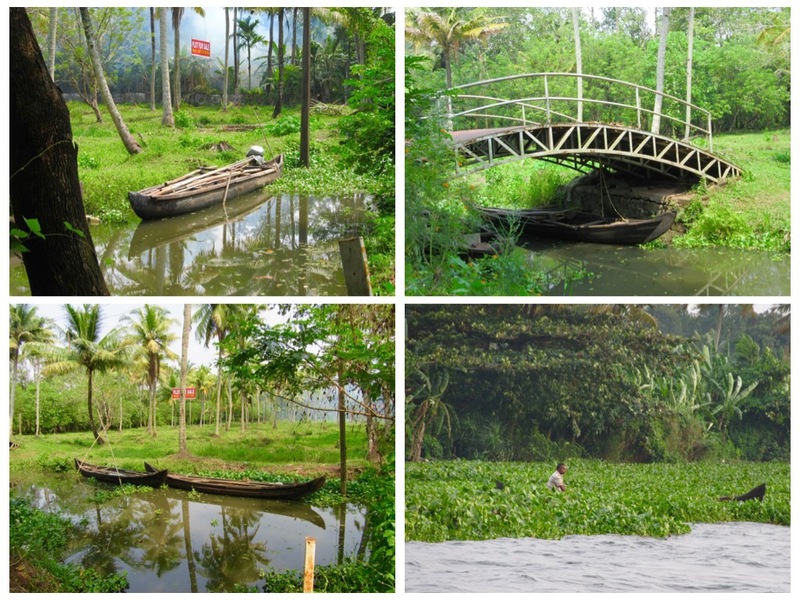 Kumarakom is a backwater, a fertile, green area with large lakes. We are staying on the shores of Vembanad Lake, which is a Great Lake. It is so large that it has its own internal wave patterns, and the other shores are barely visible from our shore. There are a few passengers ferries crossing the waterways, but vehicles must drive around the lakes, using bridges to cross between them. Technically, it is not a lake, although it is surrounded by land. At its northernmost point, it opens to the Arabian Sea, which makes it technically a huge bay or a harbor. The Great Vembanad Lake is famous for its beautiful houseboats, which are made traditionally from wood and bamboo and are roofed by coir (woven coconut fronds). Village life along the lake and its many tributary canals, which has the feel of island life in Polynesia, has been ongoing in Kerala for centuries. The area is very lush, green and beautiful. Coconut trees provide Kerala its number one agricultural crop. They are at the heart of the State’s economy, even ahead of tourism. Our hotel, the Aveda Resort and Spa, is located on the southeastern shores of scenic Vembanad Lake. Along the shores, a vast array of fisher birds, frogs and lizards live between the water lilies and lake vegetation. The hotel has a 150 meter long swimming pool, and two or three men clean the pool all day long. Because the pool is surrounded by trees and flowers, with lovely planters in the middle, their job of keeping the pool clean is never ending. The rooms are comfortable cottages, all facing the lake. Some cottages have a private plunge pool, although we did not use ours even once, preferring to enjoy the lovely, big and quiet swimming pool. Similar to most resorts on the lake, the guests spend most of their day in the resort. On the day we arrived, we took the sunset cruise on the lake, in one of the traditional houseboats. It was a lovely slow cruise, and we got to meet and chat with other guests. In the evening, we watched a traditional Kerala dance performance, which was very beautiful. The dancer dressed in traditional dress with tiny bells attached to her ankles. Her neck movements, facial expression and hand gestures were fabulous, as she dramatized for us the traditional story of the song. fried prawns Kerala style, in which the prawns were dipped in coconuts and chilly. We ate it with a vegetable Biryani, which helped mellow the spices a little. It was crispy and tasty. We also enjoyed a dish called Karimeen Pollichathu, a Kumarakom Pearl Spotted fish wrapped in a banana leaf and cooked with Kerala spices. A fish Biryani, with a mix of Masala and Kerala spices cooked with coconut oil, coconut milk and fresh curry leaves with long grain Kerala rice, was also delicious.. Everyday we swam and played in the pool and took walks. During one of our walks, we stopped to drink fresh coconut juice from a roadside stand, looked at the oils and spices that some of the stores sell, and refused lots of rickshaw drivers who were puzzled as to why we wanted to walk. We came upon the “Bay Island Driftwood Art Museum” on our way to the bird sanctuary. As the sign requested, we removed our shoes at the door. All shops, even the most dingy ones, ask you to leave your shoes at the door. The owner, wearing a traditional Sari, introduced herself as Raji Punnoose and asked us to please come in. We paid the 80 rupees per person entry fee, and she asked us to sit so she could tell us about this one of a kind museum. She had a theatrical voice, stretching out the end of her sentences for a long time, in order to emphasize what she was trying to say. She was a delight to listen to, and we found ourselves riveted with joy. First she asked us what were our ‘good’ names and where we were from. When we said that we were from New Zealand, she said that her niece, her sister’s daughter, had moved to NZ and that she now works as a therapist there. Then she started in on a highly entertaining hour long monologue, in which she blended intimate details about her life, her husband’s cancer and miraculous healing, her twenty four years of collecting driftwood, bits of prose and poetry, praises of Lord Jesus Christ and questions about things that she wanted to know about in New Zealand. “All that you see is made of driftwood. You have never seen anything like this in the whole world….dddddd. Just observe and enjoy the heart touching art of nature…..rrrrrrrr…. Only Rosewood can become fossilized…..ddddddd…. Other kinds of wood when submerged in water get rotted and decay…..yyyyy. There are whole forests of Rosewood which are submerged in the sea……eeeee. A wizard with melody played. All you see here are driftwoods that I collected when small tsunamis washed upon the islands. While my husband was in the army, we used to live south on an island in the Bay Of Bengal. Little Andaman was the name…eeeee…. You need a lot of little islands to collect the driftwood. If there were no little islands, it would all go into the sea…eeeeee. At that point she took a four foot long metal stick and seriously banged it on one of the driftwood sculptures. The sound of metal striking metal reverberated in the room. She continued to bang on each and every sculpture in the room, to reassure us that they were all made from fossilized wood. Above each sculpture she had hung a short explanation of where and when she had found the wood, and a small poem about the animal that it resembled. “No human hands can create such masterpieces that God has created from these wood…ddddd…..
How can a human hand create such beauty as the petals of the rose you see before you now…..wwwww…..
Can human hands make a cut such as you see in the mouth of the dolphin here? …..
No human hand can do this…..sssssssss. Please, ma’am, stand exactly over there and have a look here and see the snakes. I had no money for education, and being a young woman I needed money for dowry and gold to offer my husband’s family…..yyyyyyy….. I could only get the minimum qualifications to become a secondary teacher. He said that the world MUST see these masterpieces of nature….rrrrrr….. So after my husband retired from the army and his father got sick, we moved here to Kerala to help his father….rrrrr…. After a small tsunami, I would go looking for the driftwood….ddddddd. At that point, she had changed her tone and no longer spoke with the stretched drawl of a preacher. “Tell me something, my niece who lives in New Zealand, her husband is a lawyer here in India. He wants to get a working Visa to New Zealand, and move to NZ and get hired to work there as a lawyer. Jules and I said that we thought that he would have to first study British law and pass the bar exam in NZ in order to become a licensed solicitor in NZ. She looked at us sideways and asked how much did the bar exam cost? We said we had no clue. She asked us to approximate. We said we really have no clue. We know that in the USA, the bar exam costs a small fortune. I will tell my sister that the exam is very, very expensive. That you need a fortune! My niece’s husband is not a very good man. He is a lawyer but he is a spendthrift. He spends all the money. He earns money as a lawyer, and then he spends it quickly and irresponsibly. This is why my niece, who is his wife, left to live in New Zealand. She left to get away from him. She even left her child behind and ran away from him. My sister raises their child. He is not a very good husband and not a good father. My sister has the child. And now he wants to go to NZ. “I will just tell my sister that it is just too expansive. The man is a headache, troublemaker, a spendthrift…. The crocodile is the pride of my collection. Also it is very heavy. Doesn’t that look JUST like my very own Lord Jesus Christ, the lord of Love and life and miracles and all good blessings? We got a miracle as well. My husband was very sick a few years back. His prostate cancer was 99 grams big. He also had very large kidney stones. May 7th was the date scheduled for his operation to remove the prostate cancer. We gave fifty thousands rupees as a deposit. First installment of many installments for what the operation costs. My husband was cured from kidney stones as well. We got our fifty thousand rupees back and went home. Can you see my lord Jesus Christ in that wood? Stand by my Jesus and I take a photo. Madam looks very nice in her dress. Is that the official dress of New Zealand? Is that what women in New Zealand wear? Jules and I stood next to the driftwood of Jesus while she took our photos with my camera. She took out of her dress pocket an old mobile phone and tried to take a selfie of herself with us. The phone’s camera was directed out, and she did not know how to invert it to take a selfie. She tried a few dozens times to take the photo, but was not successful. She finally gave up and called over the old man who was sitting quietly in the other room. He was wearing a Lungi (sarong) and no shirt. “No, no, he is just an old man who I am feeding twice a day for many years now. He comes every day and stays here for hours. But pressing a button on a mobile phone, was more than the old man could manage. The first time he tried, he brought up google search. The second time he opened an application, and so it went, on and on. Jules was laughing so hard, it was delightful. He said that this was not a simple act of taking a selfie or a photo on a mobile phone, this was bringing a man who lives in the eighteen century, into the twenty first century, and that it would take some time…. He was trying not to laugh out loud, but he could hardly hide his amusement. After dozens of unsuccessful attempts, the lady gave up and asked Jules to take her photo with me. She hugged me, mentioning again how much she liked my dress. Before we left and thanked her a dozen of times, she asked us to help her to get the Indian government to sponsor and pay for audio guide headphones for the museum. The museum was one room, and no doubt she would not be able to handle the technology of audio guide headphones, but she was convinced that this was what the future generation needs, after she would no longer be here to give lengthy private tours. You write an email to the Indian government and tell them that the museum will benefit greatly from Audio Guide headphones. Help me to get audio commentary headphones. Not for myself, but for future generations. I do not wish to see this art treasure disappear. I want future generations to understand and appreciate the soul of the place. We promised to write and try to help. Later in the day, when we were having a late lunch at the Zuri Resort, I thought about that woman’s niece and her “spendthrift” husband. The way Raji Punnoose at the Driftwood Museum was quickly shutting off the lights after each sculpture that we already saw, made me think that perhaps her idea of what a wasteful behavior was, and what a spendthrift is, is that he leaves the ceiling fan on when he leaves the room for five minutes…. But I was sure that she would not say that he was of bad character, if he were a good man. In general, Indian people seem to be much more forgiving of character flaws than other cultures. We’ve enjoyed our visit to the Kumarakom area. It was a relaxed stay in a green and fertile land. The lake was beautiful and clean and the houseboats truly magical. The rain came every night, falling late at night and drying up by morning, making it a true paradise, in which the rain does not affect your enjoyment of the place, but falls at night, filling the lakes and watering the flowers and the trees. The water plants on the lake are free floating and when it rains, they scatter over the lake in green batches. When the waves come later in the day, they rearrange themselves by the shoreline like hedges of grass. On another afternoon walk along the quiet village streets, we met many people who were so happy to meet and greet us or introduce us to their kids. In that village nobody had mobile phones, and people gathered in the evenings to talk to their neighbors. Life seems pleasant and slow here in the backwaters of Kerala….